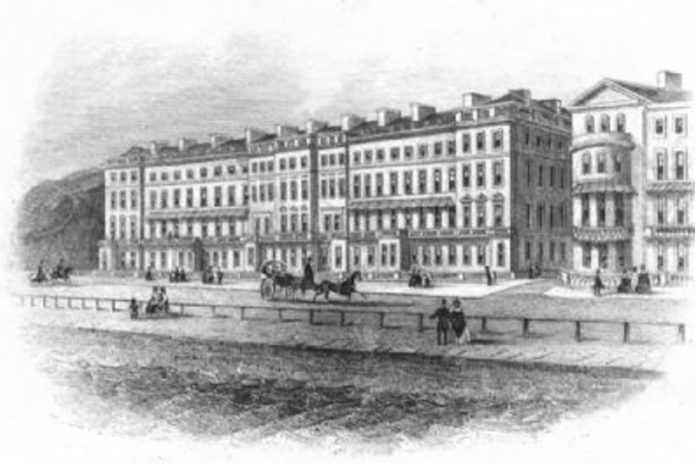 Originally named the St Leonards Hotel, the Royal Victoria was built in 1828 by renowned architect James Burton as part of his grander vision to create a new seaside resort. The hotel received the Royal Charter from Queen Victoria, who visited on numerous occasions, and later again from King George V. As the focal point of St Leonards, it became a favourite rendezvous of the Royal Family and establishment. Queen Victoria’s signature can be seen in the distinguished visitors book as “Victoria Crown Princess of Prussia and Princess of Great Britain & Ireland”, and appears in later entries as “Victoria” and “H.M. Queen Victoria”. Other members of the Royal Family in the book include: King George V, Prince Albert, Princess Louise, King Edward VII and Edward Prince of Wales whose signature represents one of the last of Royal visitors before the war. Over 500 distinguished guests have stayed at the Royal Victoria Hotel including King George V, Prince Albert, Edward VII, prime ministers Gladstone and Palmerston, and the celebrated poet Tennyson. For an extract of notable names from the Visitors Book please click here. 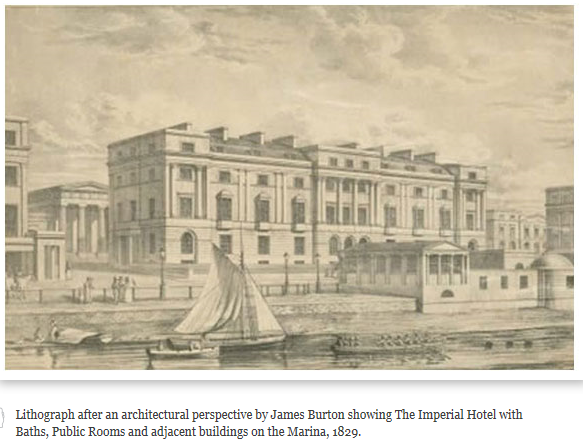 While James Burton was working on Chester Terrace in London in 1827, he conceived his scheme for a seaside resort. The original plans, now in the Hastings Museum, take no account of the coastline at St Leonards and may not have been drawn up with a location in mind. In the end they had to be adapted to fit the topography of the area. By late 1827 Burton had decided on St Leonards and negotiated with the trustees of the Eversfield Estate for a section of Gensing Farm. In February 1828 the Sussex Weekly Advertiser announced the start of building. The land purchased consisted of a coastal strip stretching for about three quarters of a mile and at its centre half a mile inland up a wooded valley known as the Old Woman’s Tap Shaw. By the end of 1828 Burton had built his own house, West Villa (now 57 Marina) in addition to the South Colonnade on the sea side of the road and the entrance archway. In 1829 a prospectus was issued showing the type of accommodation and services that would be available and by 1832 most of the terraces, villas and public buildings were complete. In addition he persuaded the Turnpike Commissioners to have the road leading to St Leonards included in the scheme, and arranged for the road through Silverhill to be built so as to give access. James Burton’s concept for St Leonards was strongly influenced by his involvement with Nash in London's Regents Park. He copied with care the grand, classical style of Nash’s terraces, the provision of service areas, public buildings for entertainment and the picturesque siting of villas amongst the groves, wooded slopes and water of the Subscription Gardens (behind the hotel). 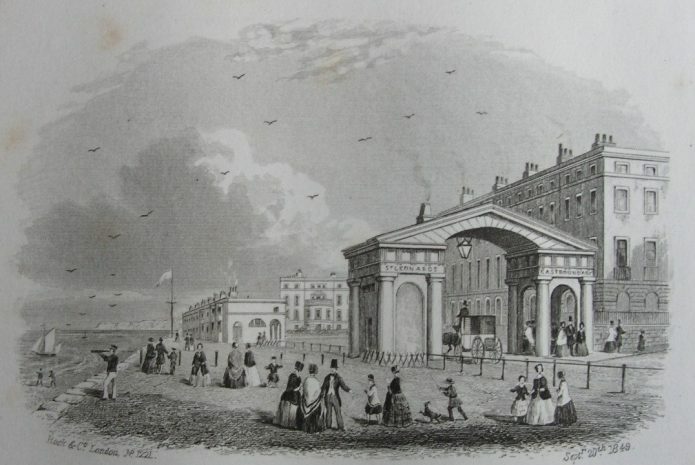 Before he died in 1837, the St Leonards (Royal Victoria) Hotel, the South Colonnade, an archway marking the town boundary with Hastings (as pictured on the left), and tall seafront houses (as far as 71 Marina) had also been completed. His grave is marked by a pyramid in the churchyard above St Leonards Church. In 1850 his son Decimus, himself a prominent architect, started the second phase of building by acquiring more land and extending the development westward. He lived in the town for the remainder of his life.